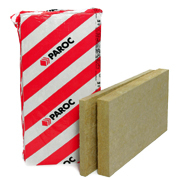 Ground slab PAROC GRS 20 is non-combustible stone wool insulation for existing and new basement walls and ground floors. The water repellent ground insulation slab can be used as thermal insulation and capillary break both in the external layer of a foundation and underground slab. The compressive stress of the slab is 20 kPa, which means that the slab can carry a 2000 kg/m2 load. To work correctly, the other side of the external ground insulation has to be against a warm construction such as a wall of floor.